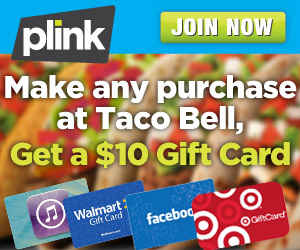 Make a Purchase at Taco Bell and Get a FREE $10 Gift Card to Amazon, Target, iTunes or More! I’ve shared several great Plink offers in the past. If none of those have been the one for you, this one might be! When you make ANY purchase at Taco Bell by Sunday, July 28th, you will be eligible for a FREE $10 gift card! You will be rewarded points, which you can redeem to purchase an Amazon, iTunes, Target, Walmart….or other store’s gift card — for free! Just sign up, link your card and go out to lunch! The idea behind Plink is to help you save money without having to remember to clip a coupon or show it to the clerk or server prior to payment. What is fun, is that you can earn even more points when you refer your family and friends to the system, which can help you bank more points even more quickly! When it comes to registering your card, you can only choose one – so choose wisely. I’d stick with the one you use most frequently (being a credit-card free family, I recommend linking to your debit card). Keep in mind that this system is new and some banks may not yet be available. If that is the case, you may have to opt to use your credit card for now. Shop at Taco Bell using the same debit or credit card you linked to your account. Your 1000 points will be awarded within 7 days (they will be funded later than your other points). Have you actually used this? It asks for your online banking username and password? Seems strange?